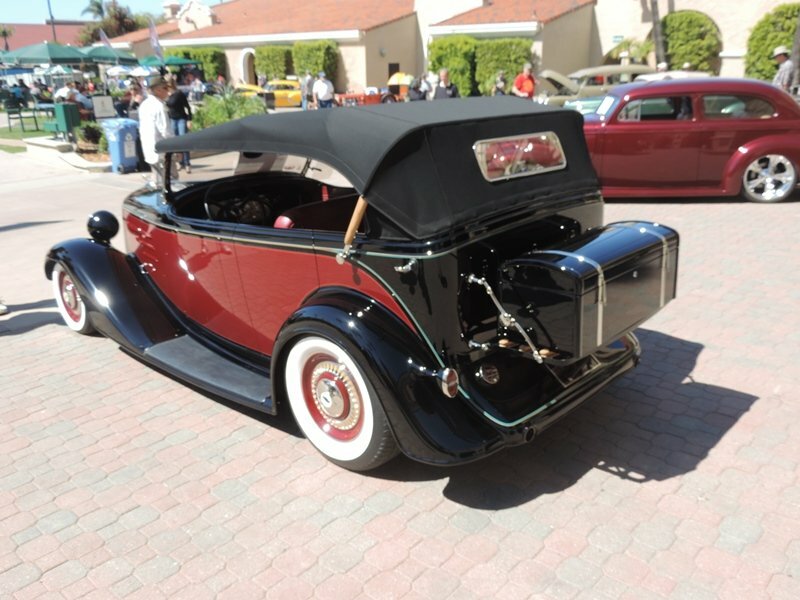 Wes and Vivian Rydell have commissioned some great classic cars over the years. 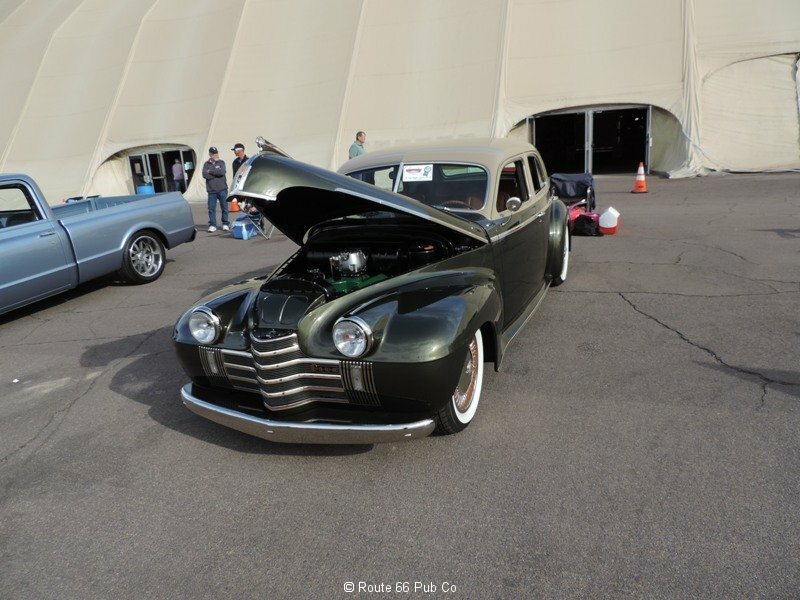 Earlier this year at the Del Mar Goodguy’s show, their 1940 Oldsmobile “Agnes” was selected for the 2016 Street Rod d’Elegance Award. 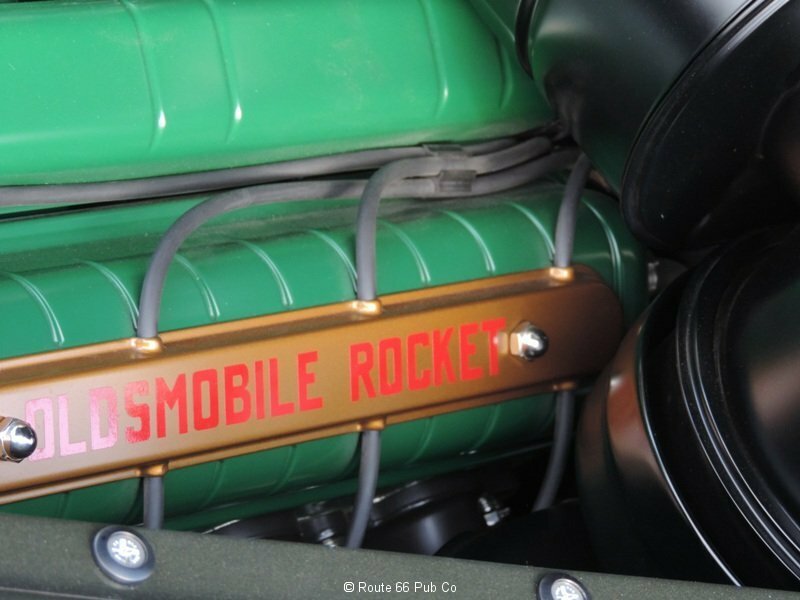 This rod had languished for a spell before finally being completed by Rad Rides by Troy. 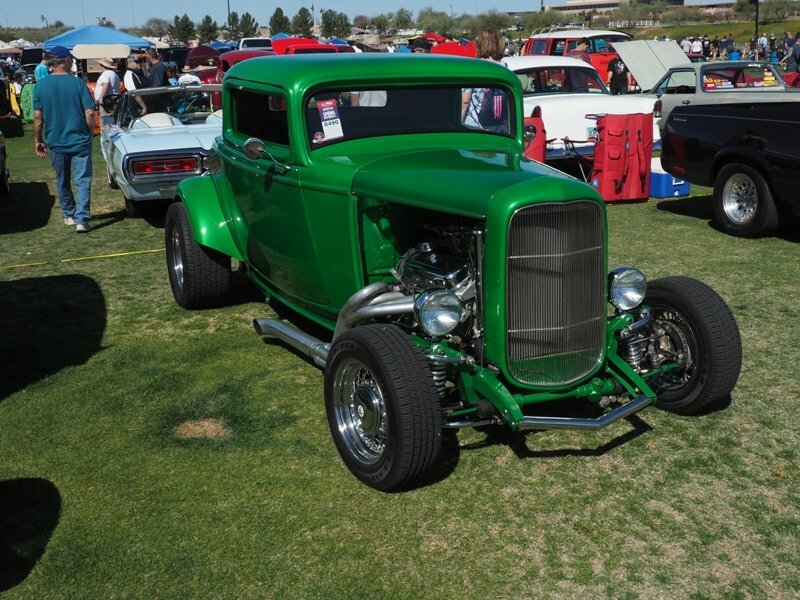 We took these shots when they displayed it in Scottsdale, AZ at the Spring National Goodguy’s Show. 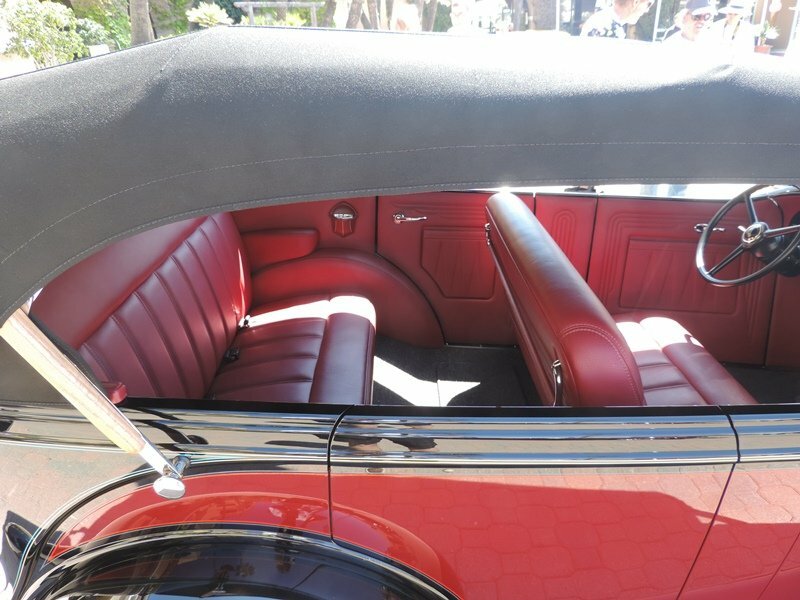 They have won this award twice before, including in 2014 with their controversial 1935 Chevy Phaeton. 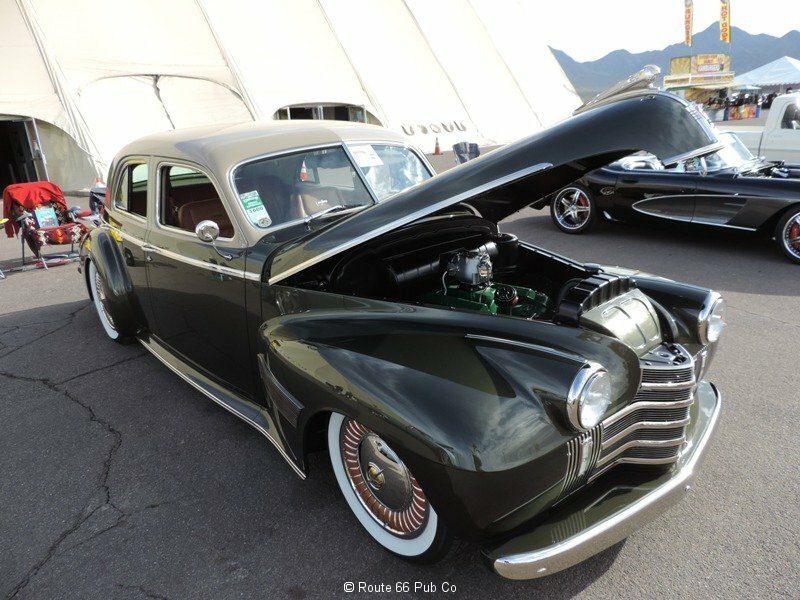 Now we can’t wait for the 2016 SEMA Show, where they will be unveiling “Madame X”, a 1939 Cadillac coupe. 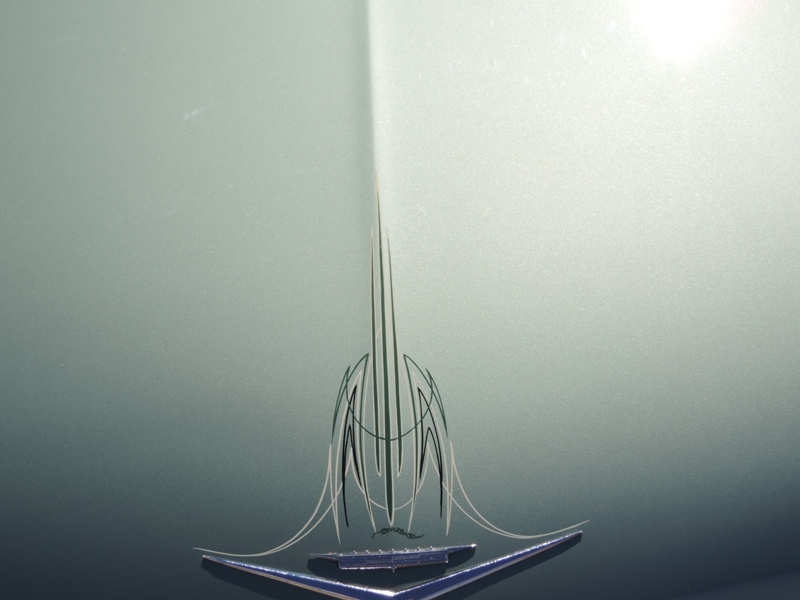 It is a takeoff on a concept design based on a 1935 Cadillac 60 Special Sedan originally designed by GM stylist Art Ross. 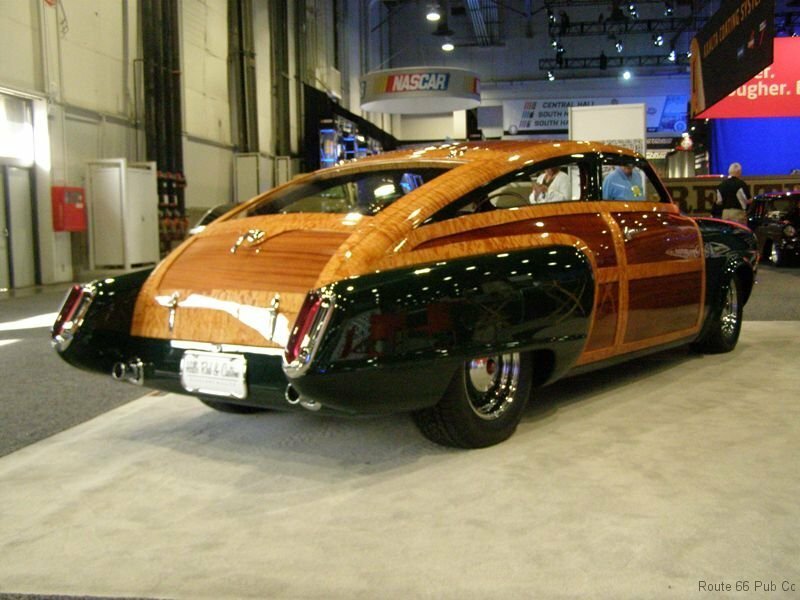 So this car was never built until Chip Foose opted to take on the build. Of all the unveilings scheduled during the SEMA Show, this is the most anticipated with some sneak peeks offered recently. Can’t wait to see it in person on Tuesday! 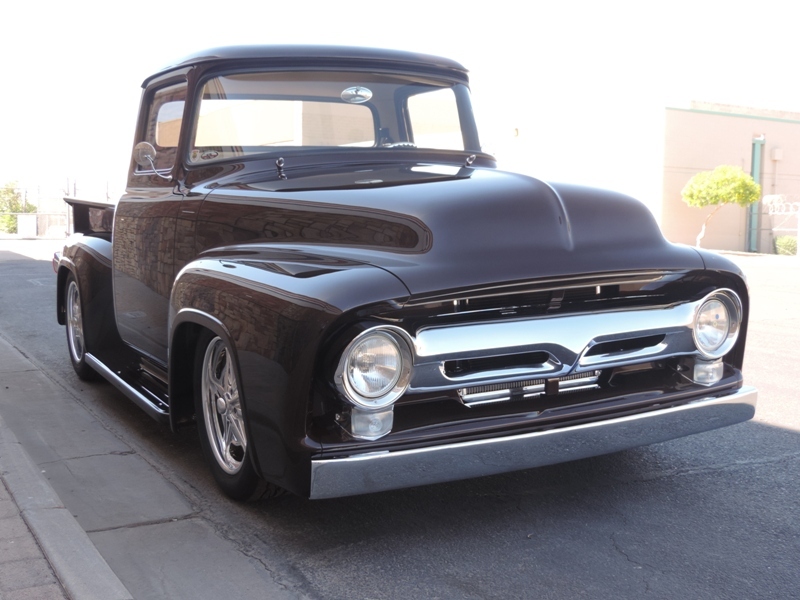 Drew’s Garage in Tempe, AZ is featured in the August, 2014 issue of Performance and Hot Rod Business. Our friends at the publication did a nice feature on this local garage. Here’s a link to the six page article. 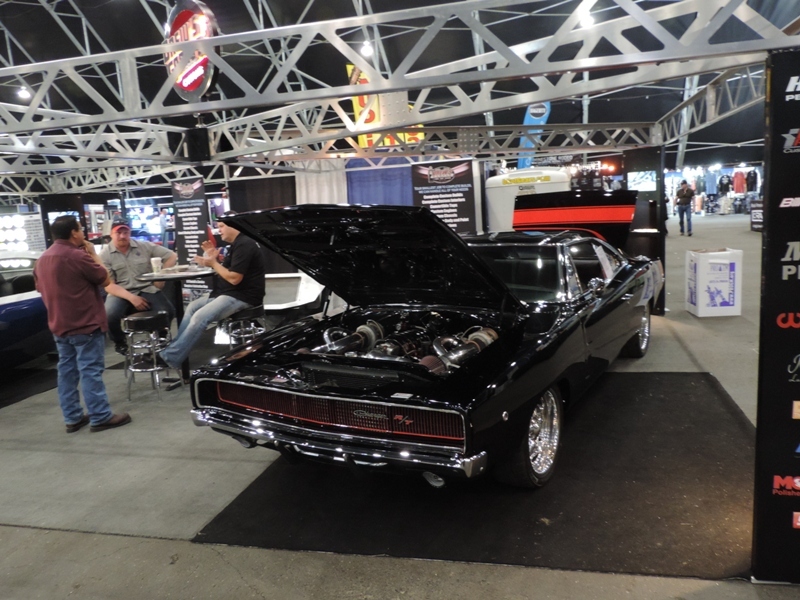 We recently featured Drew’s Garage with this article on Larry Fitzgerald’s 1968 Dodge Charger. Here’s the link as well. In the article. 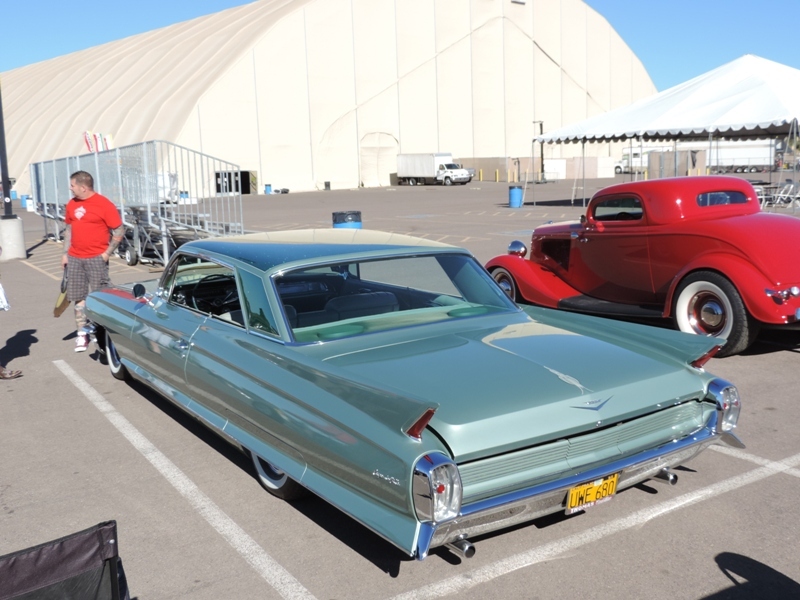 the owner Drew Tennant discussed the origins of his shop and how showcasing his cars at Barrett-Jackson and Goodguys Rod and Custom helped his business grow. It is interesting to read that most of his employees are auditioned and hired from out of state. Nice compliments to a true class act. 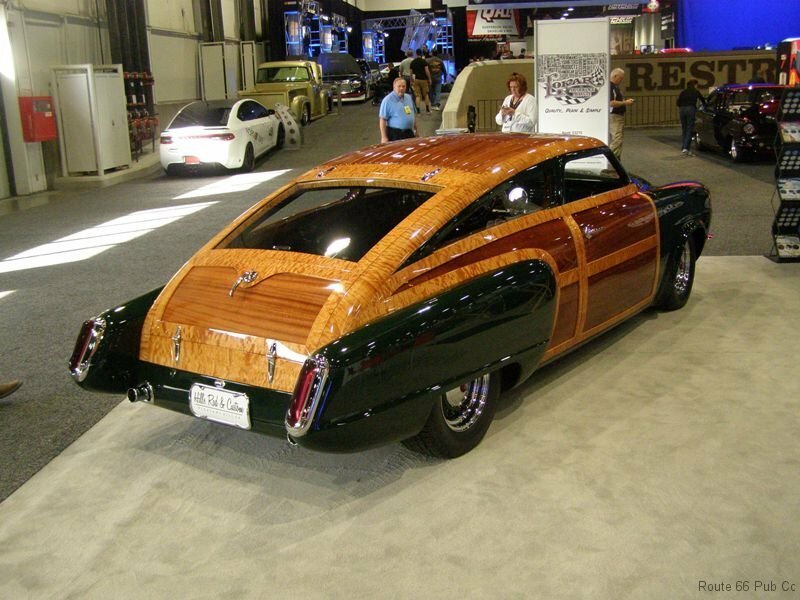 Hot Rod magazine’s August 2014 highlighted two cars that we first saw at the SEMA Show. Funny how some cars just stand out and end up being touted by all? 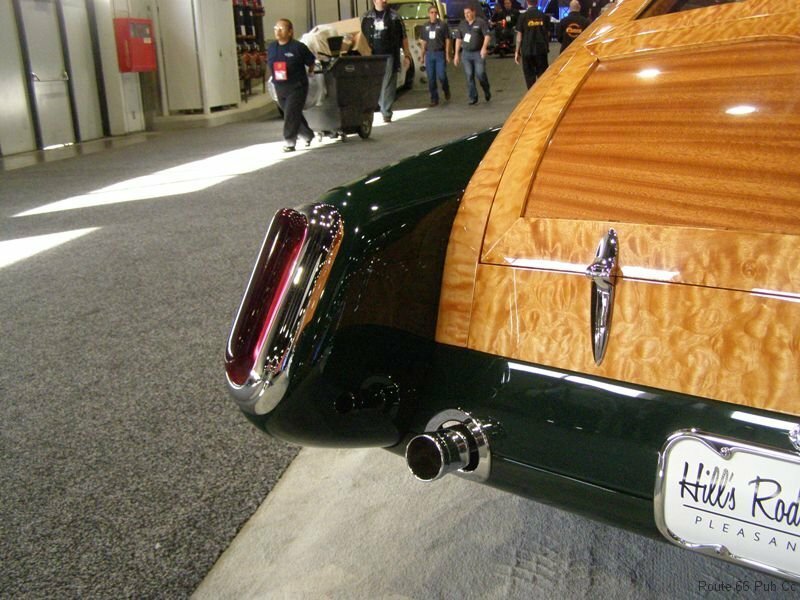 Out of the thousands of cars at SEMA, some just naturally are just dang drop dead perfect and deserve detailed views and attention. 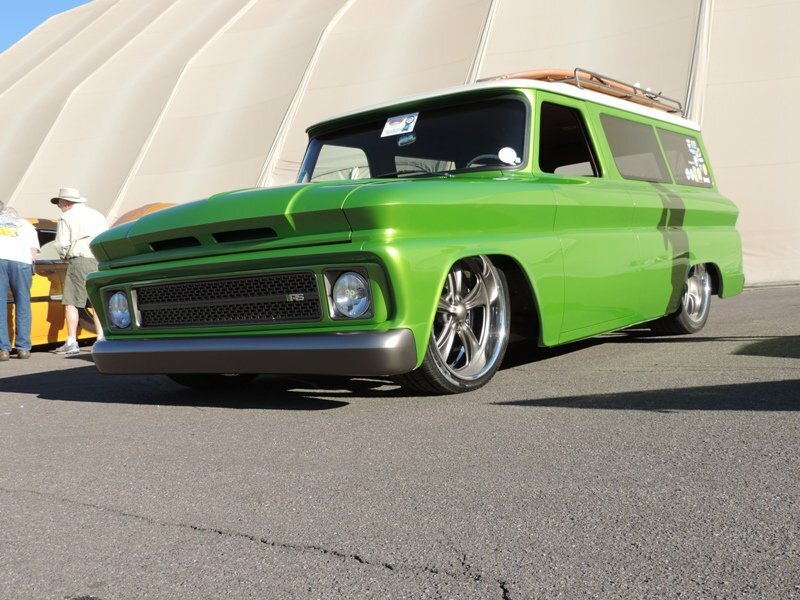 Our friends at Hot Rod Magazine For August, 2014 devoted three pages (page 108-110) on Mr. Gasket’s Lime Crush – a 66 Suburban. We gave you our view of this awesome build here. Great attention to detail and just about every body panel was massaged to some degree. 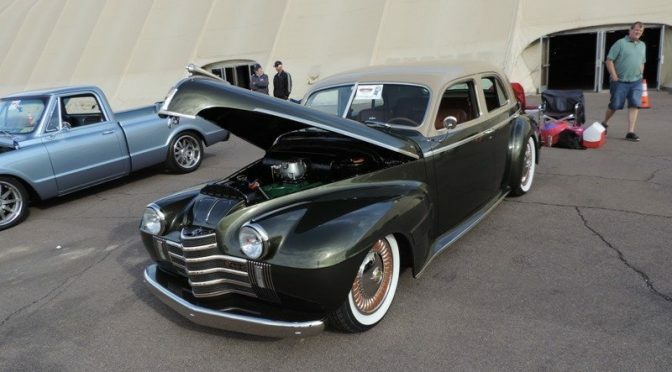 In the same issue, they take a look at a 51 Studebaker owned by Dennis Varni. 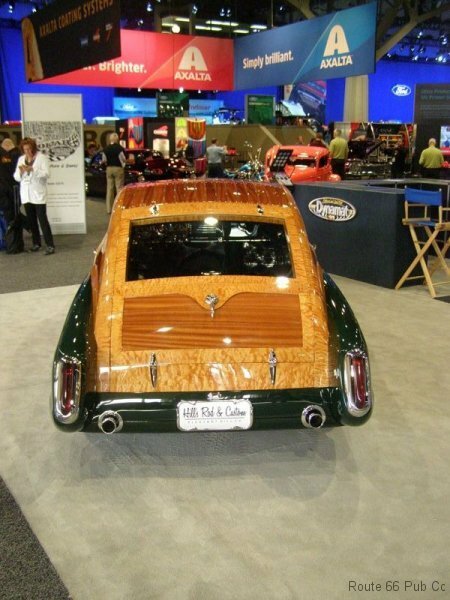 It too was at the SEMA show and drew plenty of admiring glances in its prime aisle spot. Eight pages don’t do it justice, so we had to add our pictures too. 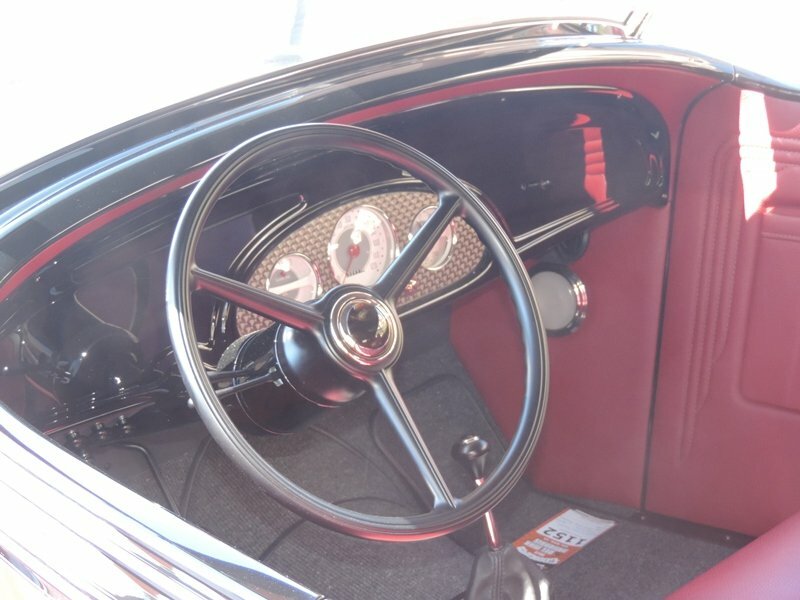 The Studebaker actually passed through three sets of hands before completion. It sits on an Art Morrison frame. 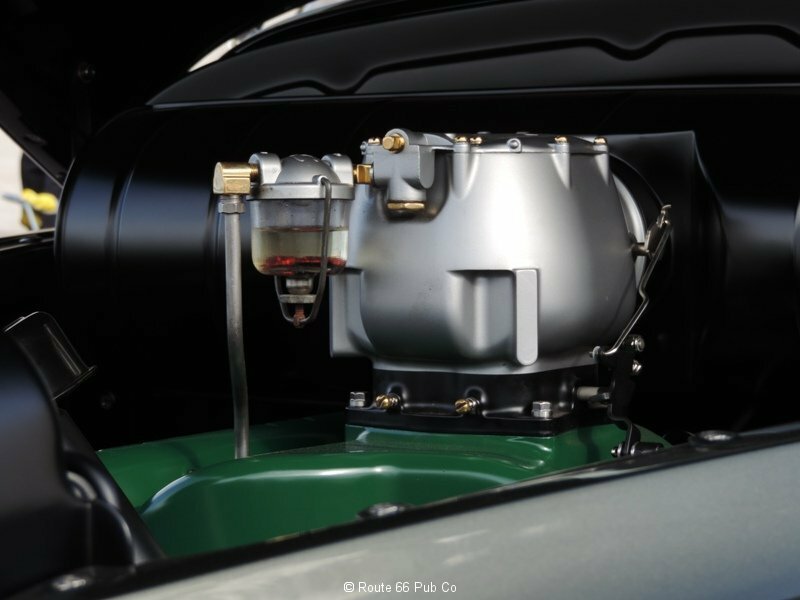 A Ford 427 engine has fuel injection and uses a GM 700R4 transmission. 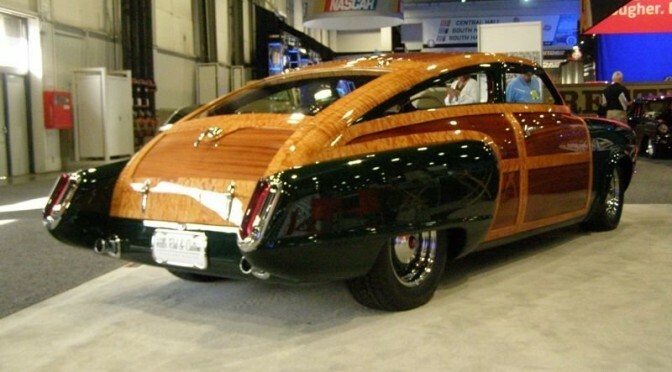 The wood work is spot on beautiful. 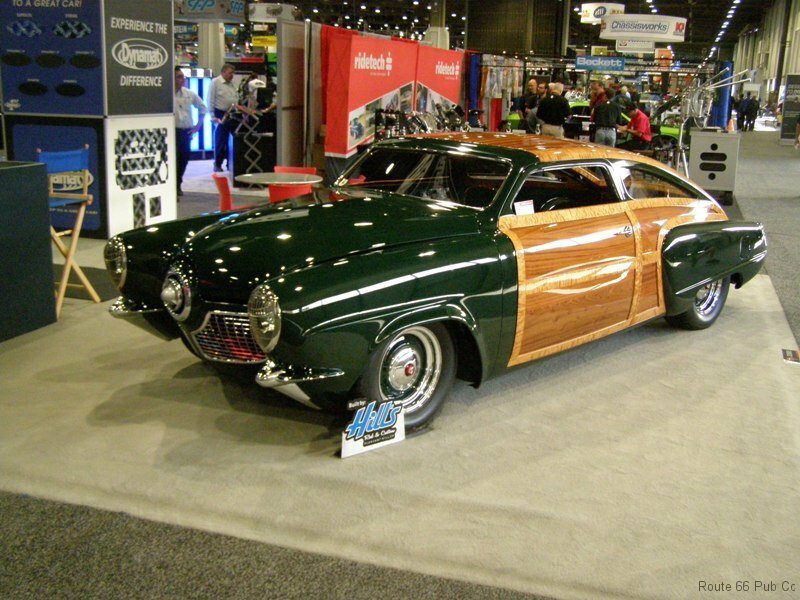 Lots of onlookers took double takes trying to figure out if Studebaker ever made a woodie! 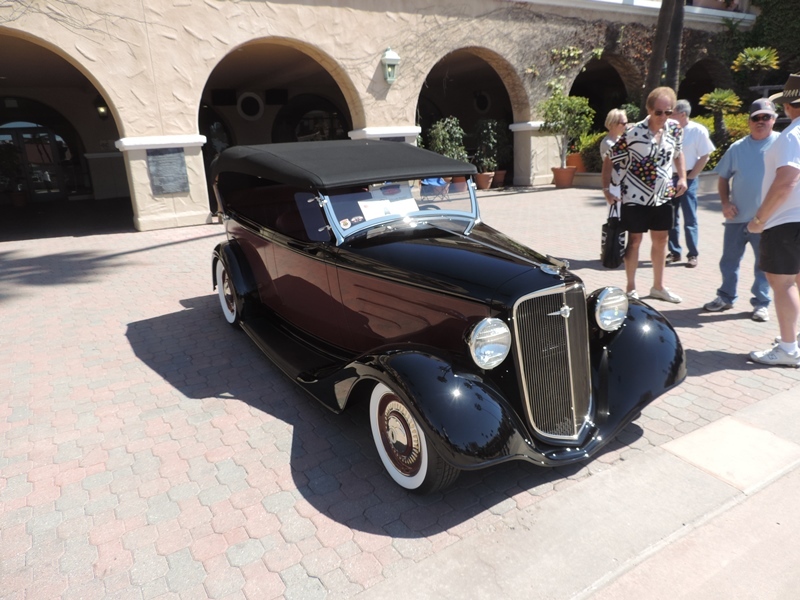 At the Goodguys show in Del Mar, California, they selected this 1931 Ford Truck as a finalist for Early Truck of the Year. We previously commented on the Del Mar show here. 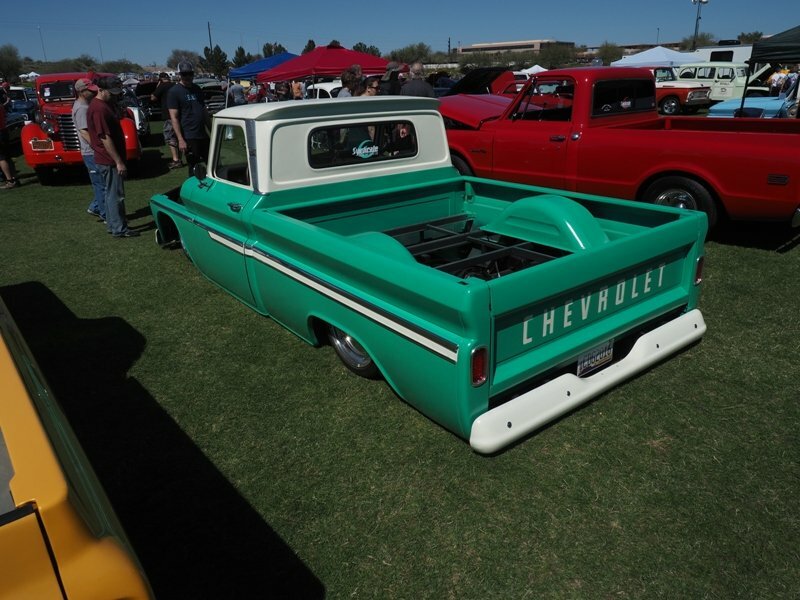 At other venues during this year, Goodguys will select some more finalists before awarding one truck the coveted title of “Early Truck of the Year” at the Goodguys finale in Scottsdale, Arizona in November, 2014. In fact at this final show of their year, several Yearly Awards are selected. 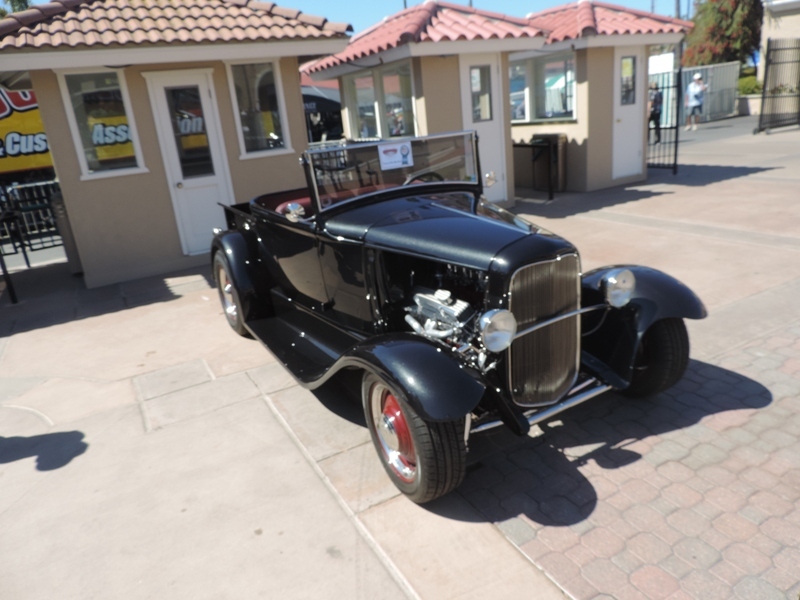 This 31 Ford truck kept a stock looking exterior but freshened up the engine and drive train. 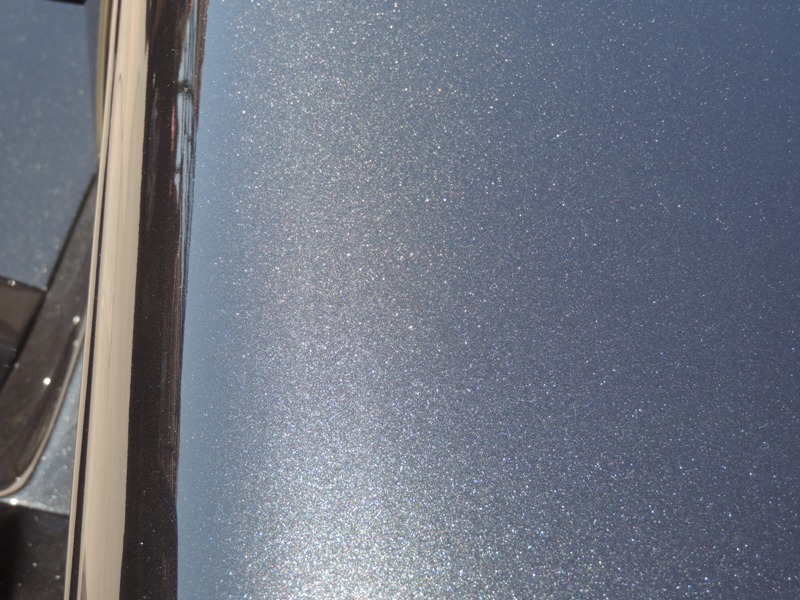 The paint had a color flake to add a little sparkle. Henry Ford would not recognize the power plant under this hood but I guarantee you it’ll move out from the traffic lights. 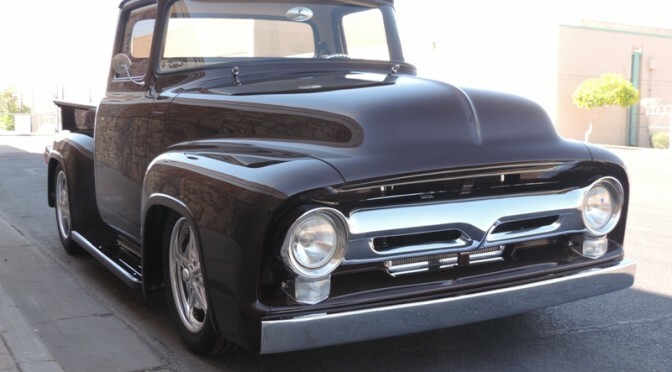 I especially like the wheel treatment with the white walls and maroon rims and chrome centers. How about you? 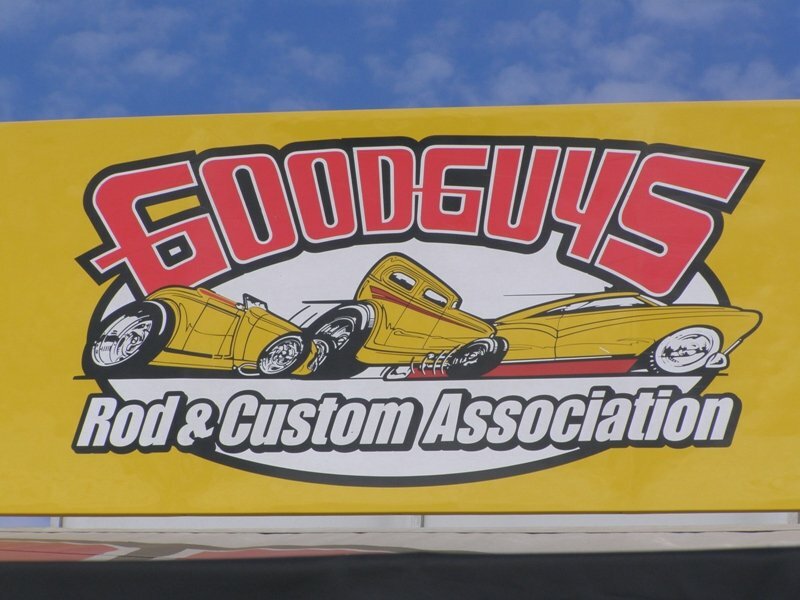 The Goodguys Rod and Custom show crosses the country with shows spread across numerous venues. 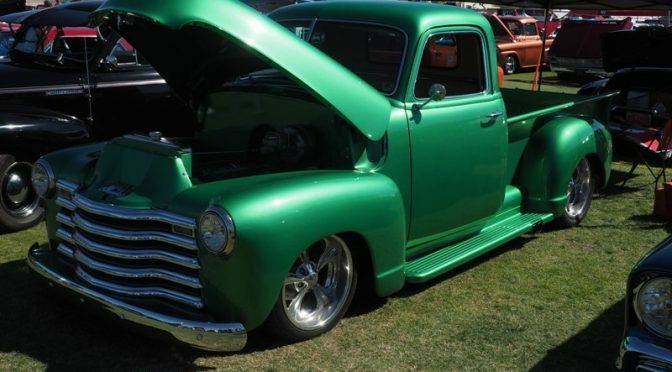 Although their name says “rod and custom”, in truth all sorts of cars and trucks show up at these three-day weekend events. 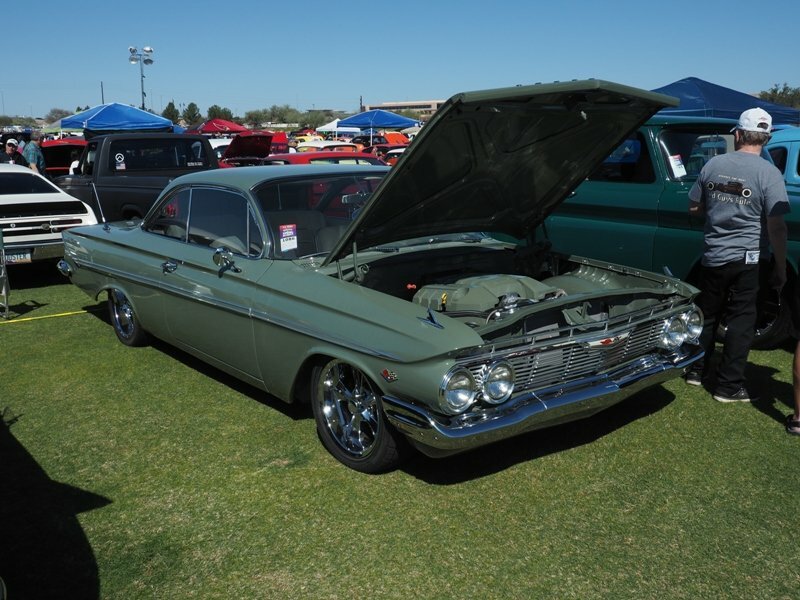 Plus on All American Sunday, modern muscle cars are welcome to join the party, so you get the opportunity to see a little of everything at one of their shows. 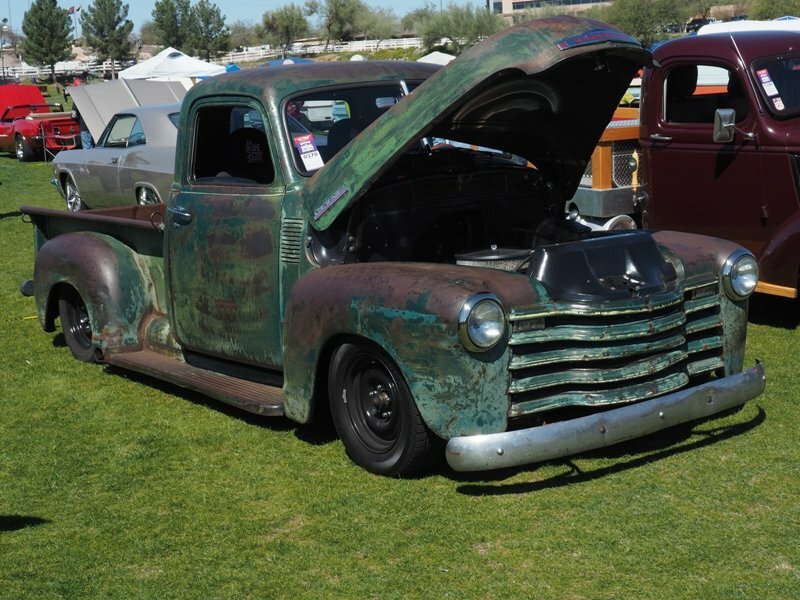 Entrants pay a modest fee for all three days of the show and the public pay at the admission gate for a chance to see some awesome classic cars and trucks. Mots site even do a road course so cars can drive a timed cone outlined course to strut their car and their driving skills. 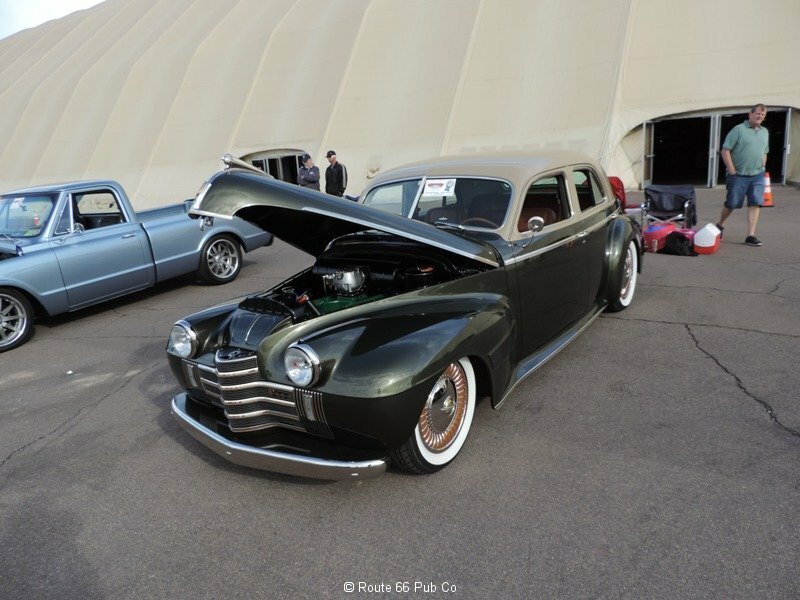 Here is a link to our complete coverage of the fun times at Goodguys Rod and Custom car show in Del Mar, California show last month. 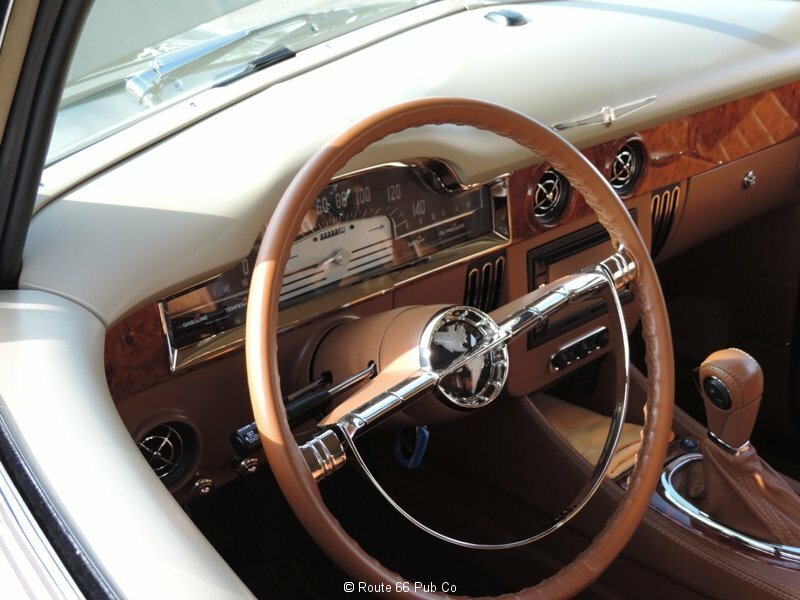 This is our article as posted by eBay Motors. 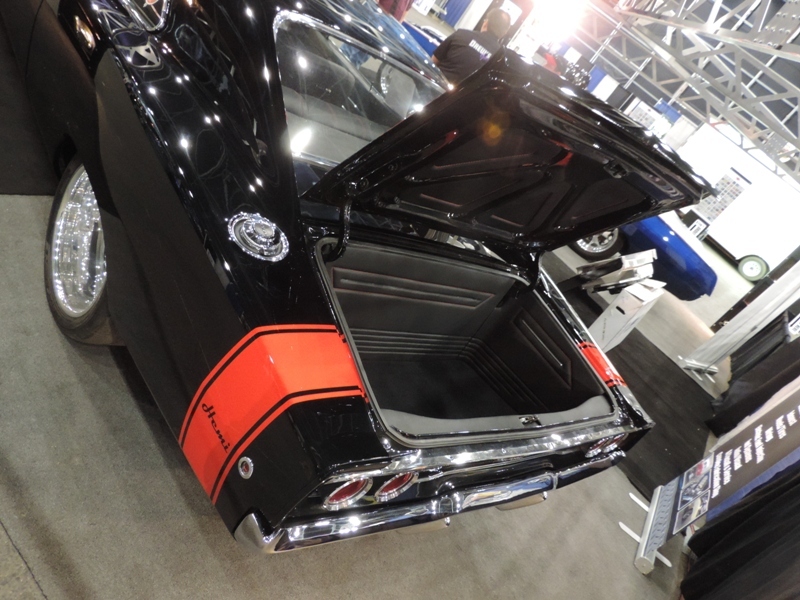 We gave you a sneak peek of the car show before, with this article. 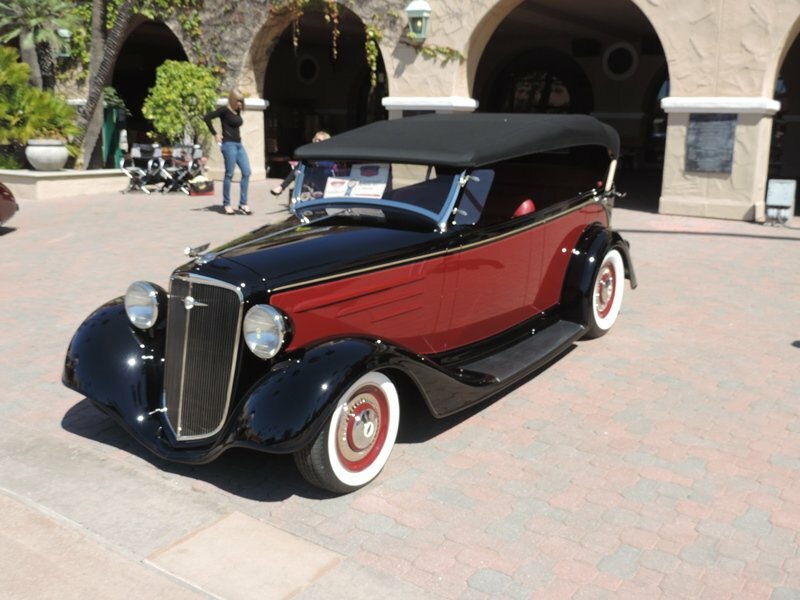 Goodguys in Del Mar sort of gets the West Coast car guys to dust off the cars and start up the car season. We had perfect weather and some great cars to look at. 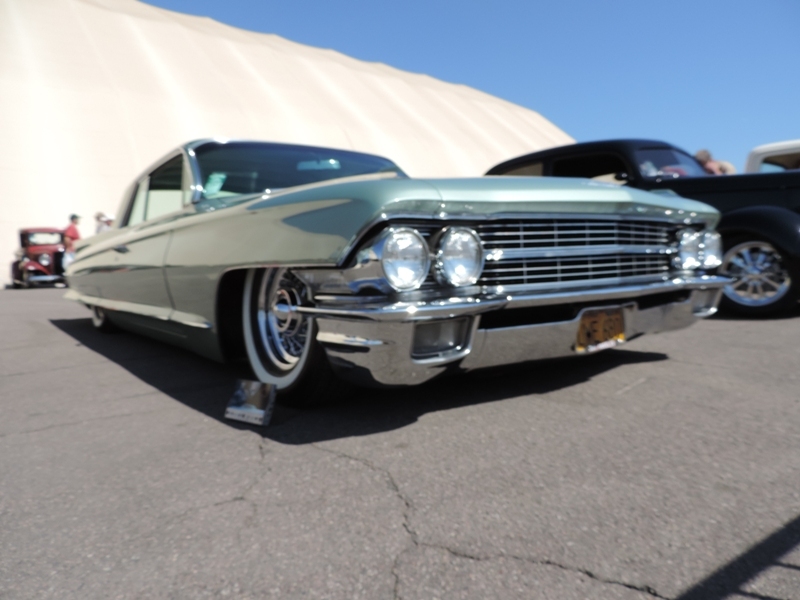 Check out the article on eBay and let us know your favorite cars . Many people know Larry Fitzgerald as a NFL football player with the Arizona Cardinals. He is well known and well liked by both the fans and the sports media. 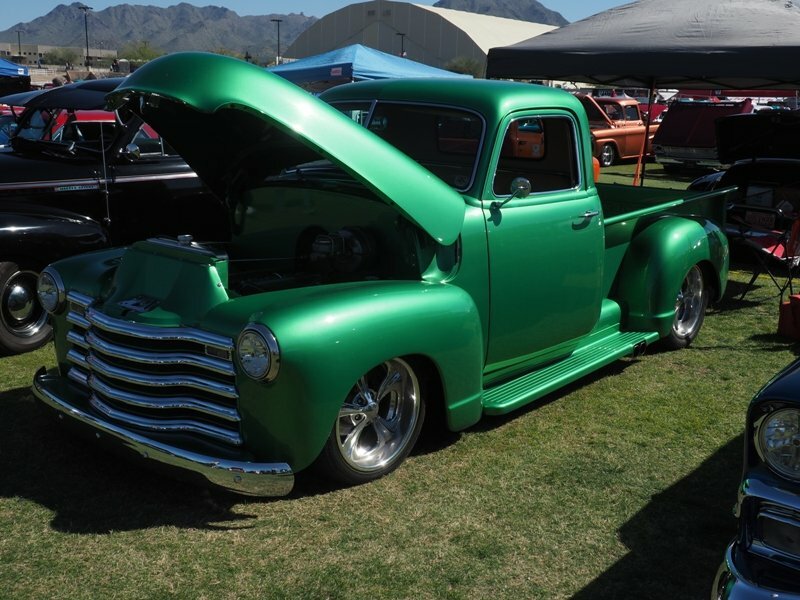 He also is present for numerous charitable events in the Phoenix area. 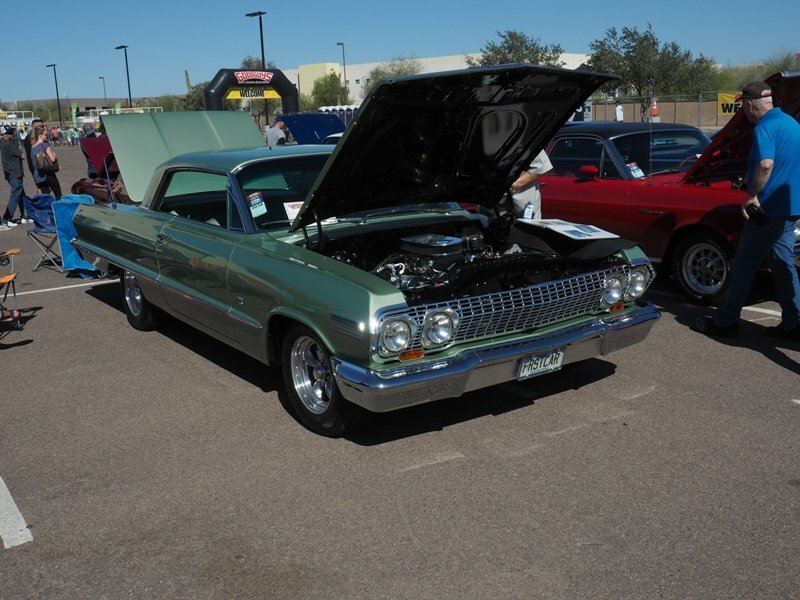 He is always willing to lend his name and time to Phoenix area charities. But did you know he also is a car aficionado? Have you ever seen his 1968 Charger? 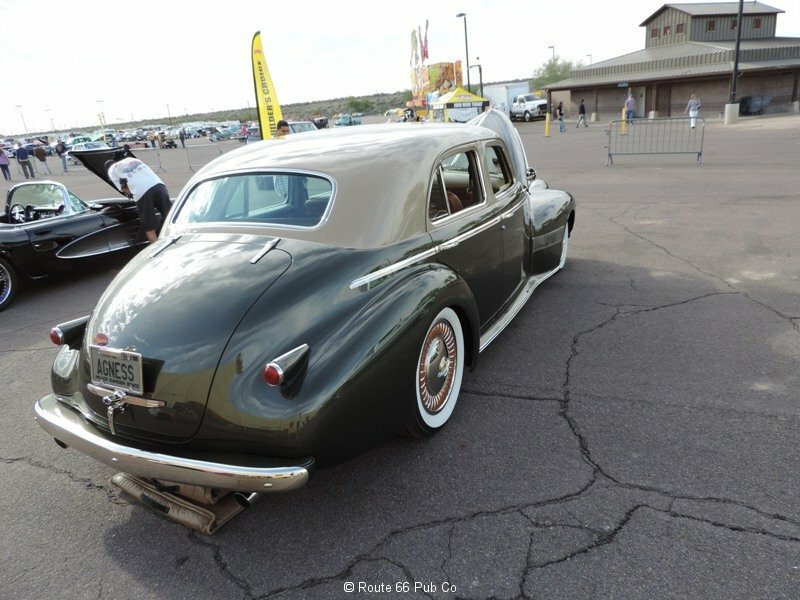 Recently at the Goodguys Rod and Custom 5th Spring National car show held in Scottsdale, AZ Larry Fitzgerald’s 1968 black Charger was on display indoors under the huge tent. 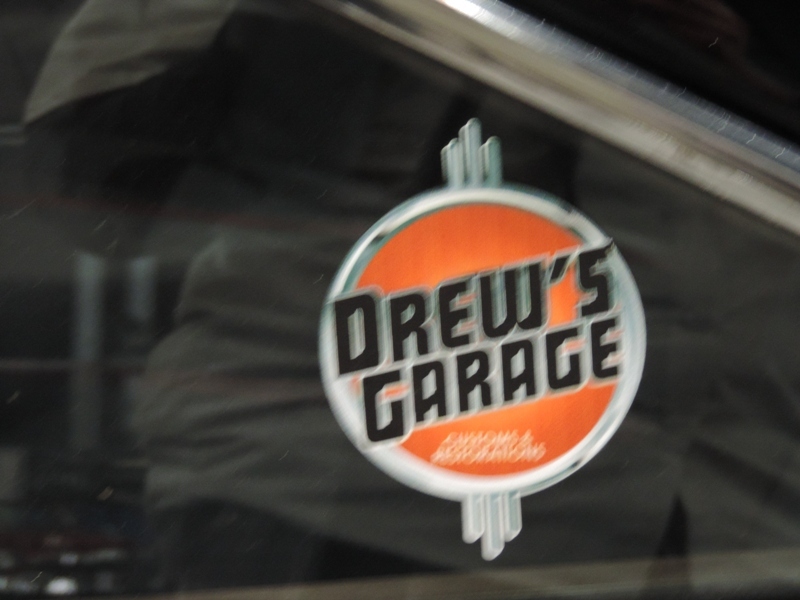 It was part of the display for Drew’s Garage, a local car shop with a great following. 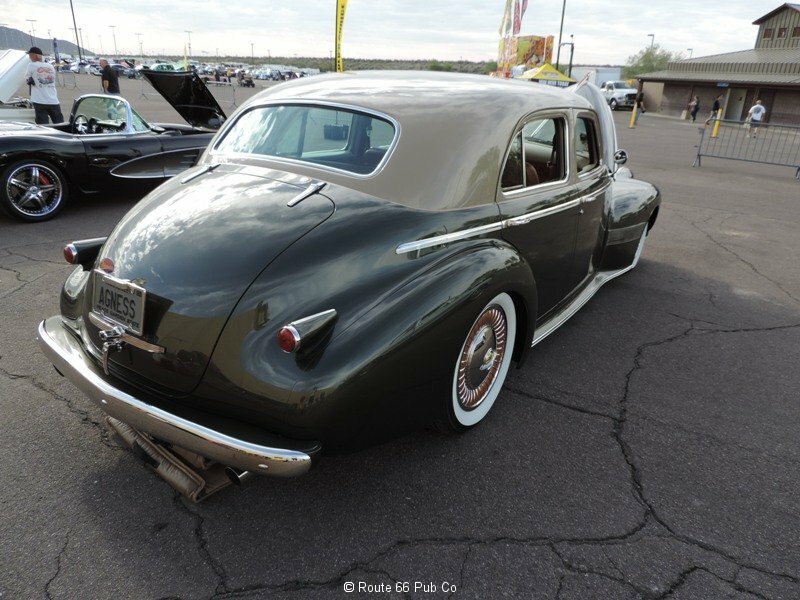 Drew’s Garage has been a presence in the local car scene for years and often has hosted a cruise night as part of Goodguys. 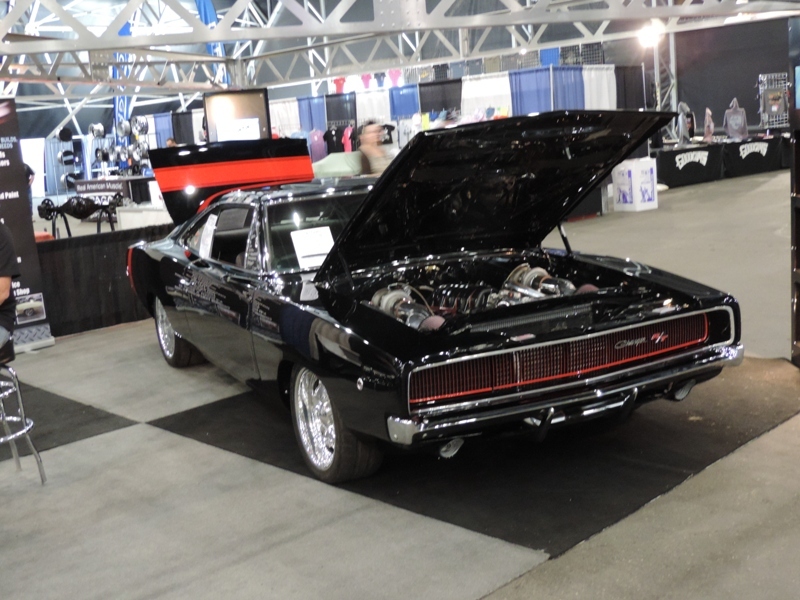 This year they opted for a smaller presence at the Spring Nationals show, but small is hardly used when describing Larry Fitzgerald’s Charger. Here is the shop’s photos of the restoration indicating the quality of their workmanship. 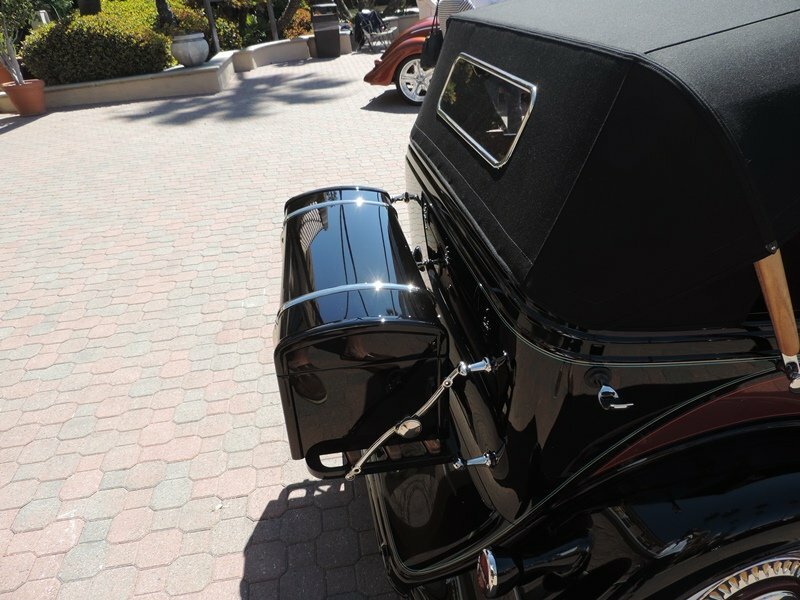 The black beauty was given a total makeover by Drew’s Garage. 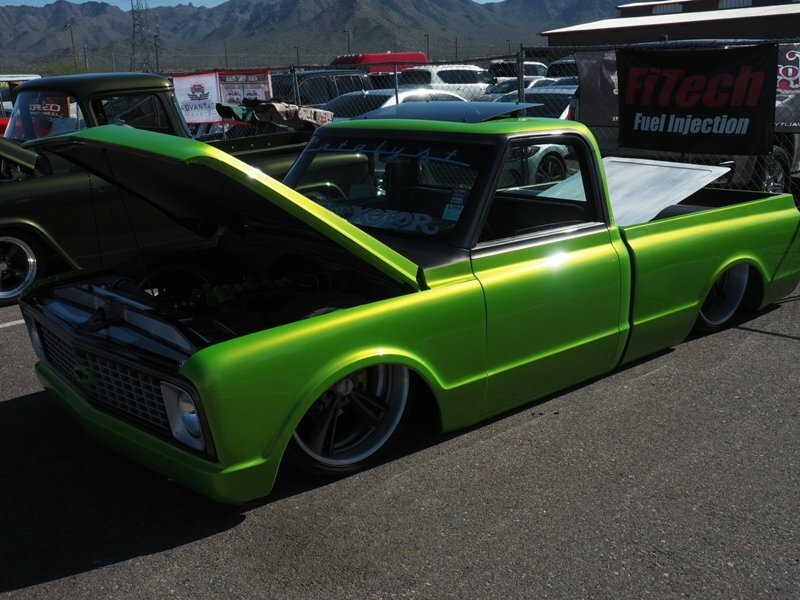 Of course it had to have a Hemi but this one is backed up with twin 62 mm turbos. 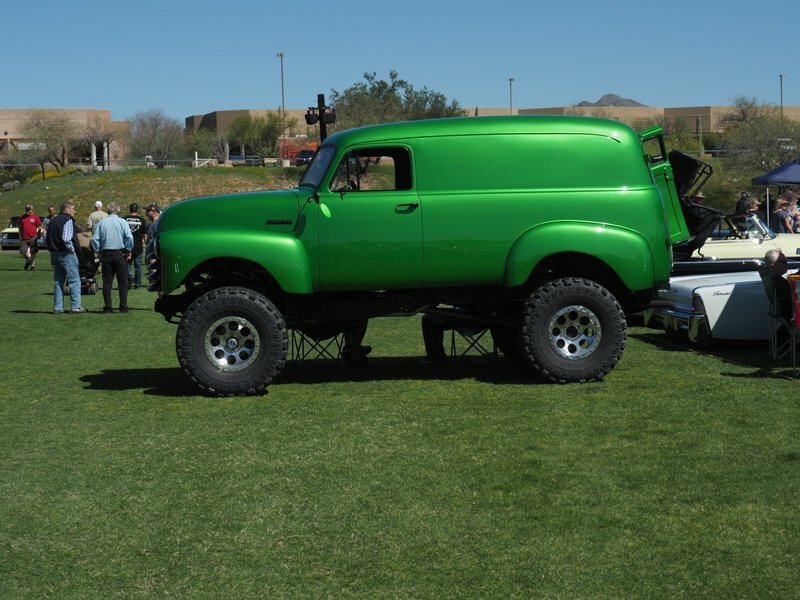 It was mated to a Hughes automatic 4L80E transmission and a Dana 60 rear end. It slows down with Wilwood brakes; 6 pistons in the front and 4 pistons in the rear. 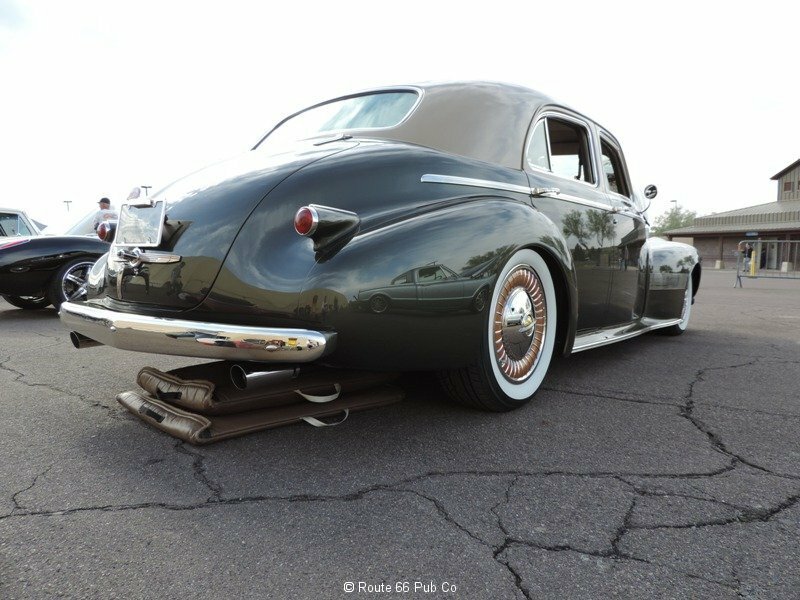 The rear is held in place with a custom 4 link rear suspension. 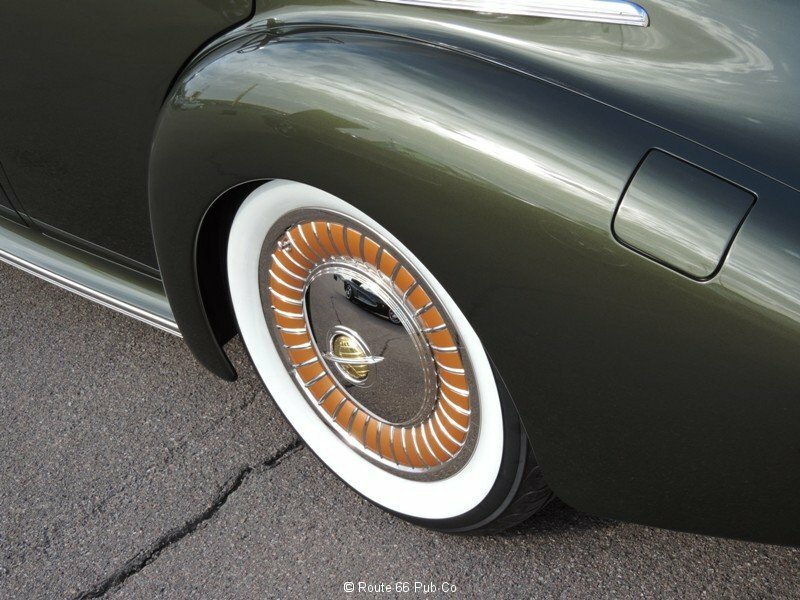 To top it off the Charger rides on Budnik wheels and has a Vintage AC for Arizona’s hot summers. But this car is hot year round! What do you think? 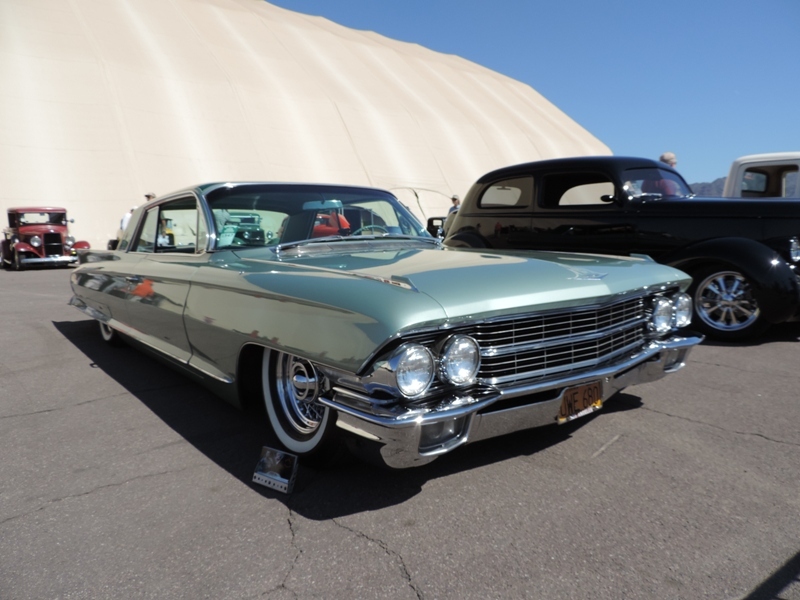 At the Goodguys Fifth Spring Nationals Car Show held in Scottsdale, AZ Dan Sobieksi brought out his green 1962 Cadillac. 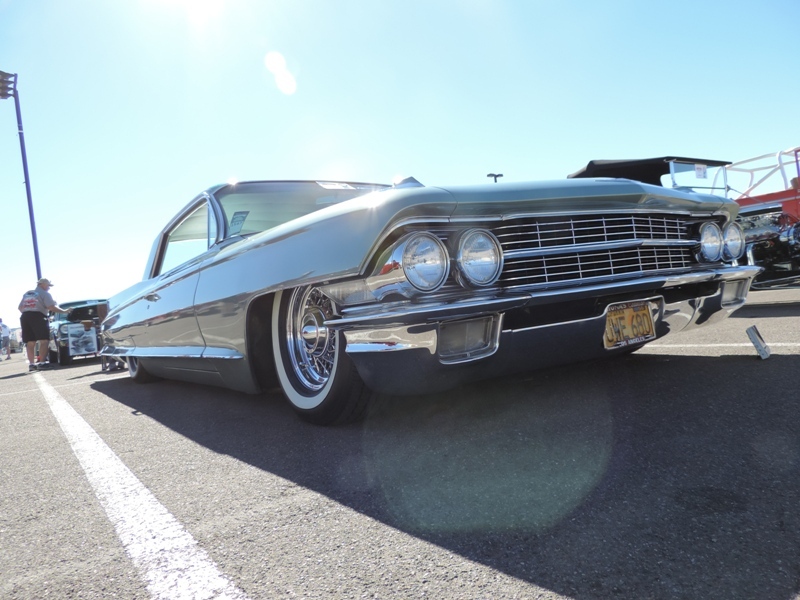 This Cadillac was scrapping the asphalt. The judges were right to award it their So Low pick. 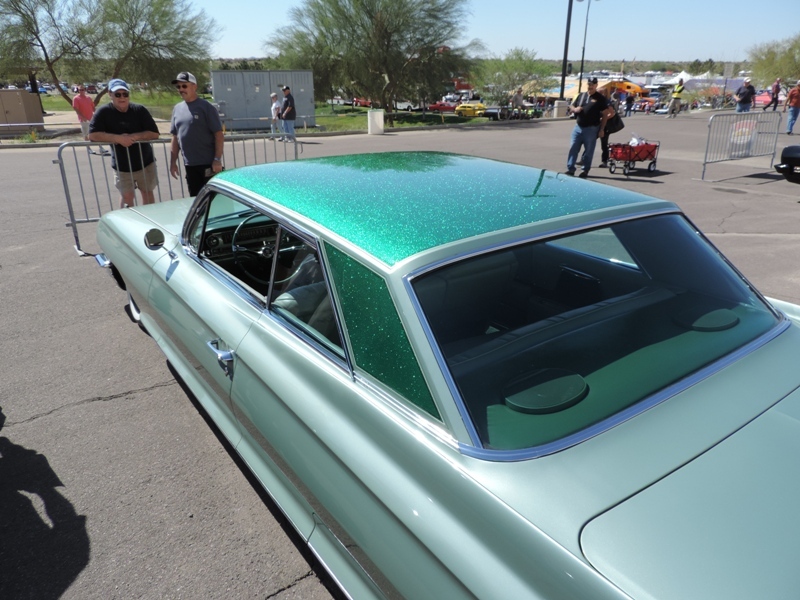 The Cadillac was down low but also spotlighted a custom authenticate flake green paint job for the roofline. 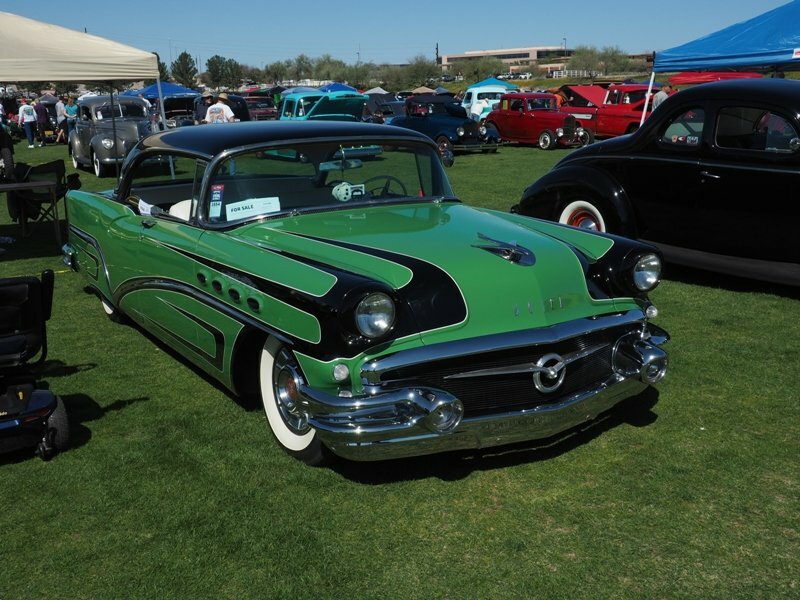 In fact it was painted just months before the Goodguys Rod and Custom show. 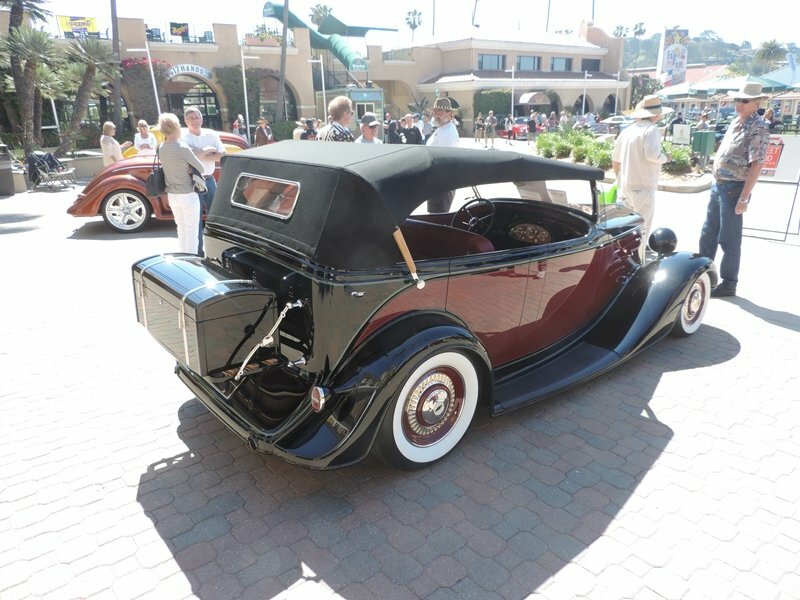 Everything about this rod screamed period authentic custom. Nice to see such a good eye for detail. 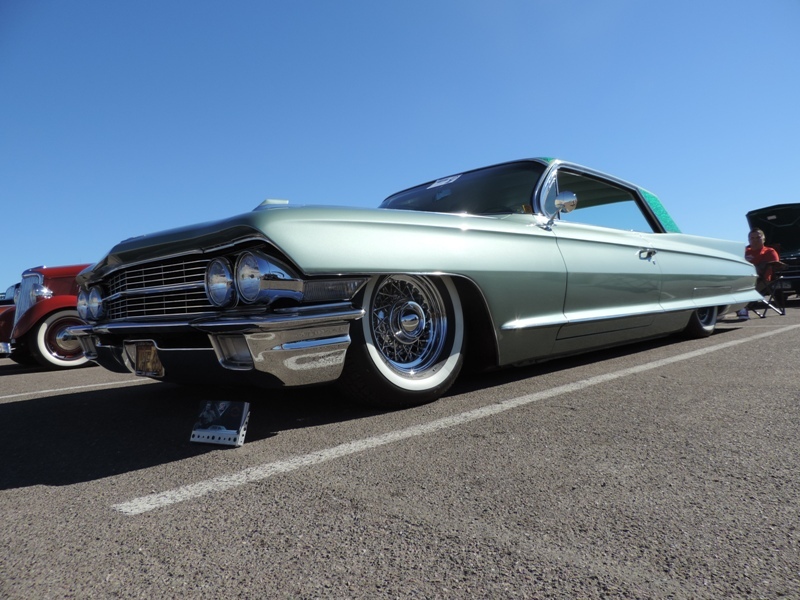 Dan has a Facebook page for his 1962 Cadillac. 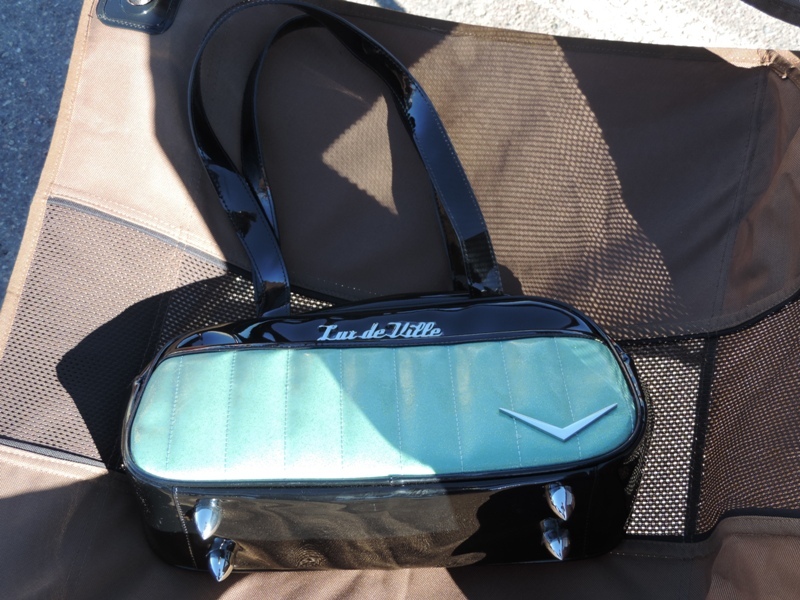 On Sunday in the awards area, Dan’s lady friend had a matching purse. Have to wonder which came first the car or the purse?